Astroneer Patch 158 is now available for download. This is a Pre-Alpha Early Access version. Currently, Steam ‘Early Access’ users are receiving this update immediately. The new update will take 48 hours to reach your console or Windows 10 machine. The new Astroneer 0.3.10158.0 patch brings bug fixes, including some priority fixes for the games recently updated Research Curve. Additionally, Astroneer now supports Turkish language, Hydrazine canisters are now explosive, and a few other minor updates. [AS-939] – Hydrazine can explode! [AS-1011] – Gas hazards now despawn after being uncovered from the terrain. [AS-1042] – Add Turkish language to the build. [AS-1063] – Add Early Access/Pre-alpha + Build # to on-screen overlay. 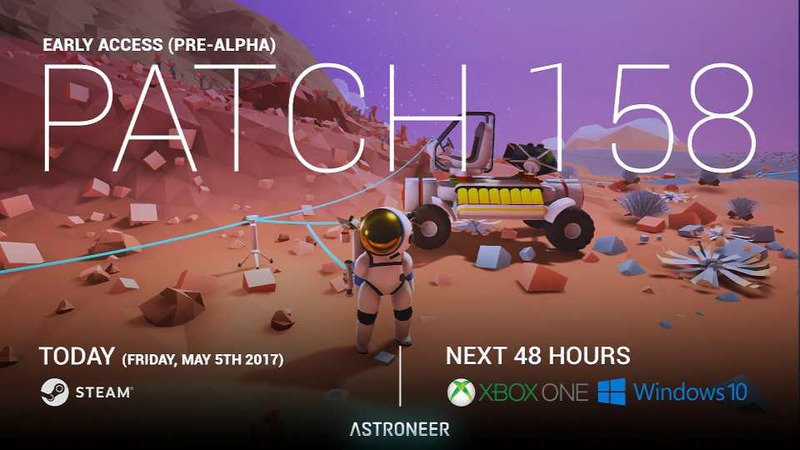 [AS-450] – Astroneer Patch 158 fixed an issue causing the occurrence of visible seams in terrain in MP or after saving load. [AS-935] – Improve rover stability in MP so they no longer unrecoverably fly apart. [AS-979] – Most rocks now despawn after being dug up. [AS-990] – Astroneer update 158 fix gamepad camera behavior while in planet navigation. [AS-996] – Astroneer update 158 fix incorrect research unlock text. [AS-1025] – Fix ejected resource nuggets being ungrabbable for non-host players. [AS-1026] – Astroneer update 158 fix various audio cues playing incorrectly in MP. [AS-1036] – Fix power cells not unlocking despite the player receiving an unlock message. Check your update and download Astroneer Patch 158.